“Team Spirit: An eagerness to sacrifice personal interest or glory for the welfare of all. The greatest coach of all time was born in 1910 on his family’s farm in small town Indiana. John Robert Wooden, one of six children, was raised on his home state’s first and greatest love affair, basketball. Day and night, on dirt courts carved out of corn fields, young John learned his craft and repeated it with unparalleled industriousness, a virtue he learned from his hard-working father, Joshua Hugh Wooden. Wooden’s life and career, especially coaching at UCLA, where he won an unprecedented ten national championships in a twelve year span, has recently been captured by CBS Sports journalist Seth Davis in Wooden: A Coach’s Life, and we learners and leaders would do well to consider a small sampling of leadership lessons from his nearly 100-year run of leadership. Throughout his playing and coaching career, John boasted that he had never endured a single losing season. Although that was not entirely accurate, his consistent success from the cradle to the armchair is without question. Young Wooden won three Indiana state championships as a high school player and won a scholarship to Purdue University, where he played for the great Ward “Piggy” Lambert. In his three varsity seasons at Purdue (freshmen were not allowed to play varsity sports even into John’s coaching days), he was the first college player ever to become a three-time consensus All-American and led his team to the 1932 National Championship. How did he manage an entire career of winning–some 49 out of 50 seasons? As a player, no one outworked young John. He earned the nickname “the Indiana Rubber Man” for his constant motion and reckless pursuit of loose balls. He spent hours daily working on simple drills, and once made 134 consecutive free throws over 46 games in his short-lived professional career. Long before gaining national publicity for his coaching in Los Angeles, John earned bachelor’s and master’s degrees in English, spent three years in the U.S. Navy during World War II, and crafted the first version of his infamous “Pyramid of Success” at the age of 23. For Wooden, success was never about closing out games or winning championships; success wasn’t even about leaving behind a legacy of greatness to his players and family. Success, rather, is a “peace of mind” that comes about from knowing you’ve put in the work, planned carefully and worn yourself out for the sake of something bigger than yourself. Results will follow hard work, Wooden believed, and they always did. In the pursuit of success at any level, there is no substitute for work. When Wooden made the transition from playing to coaching, he took a maniacal approach to preparation. He taught his players, from the teenagers of small town Kentucky to Lew Alcindor and Bill Walton at UCLA, how to properly toughen their feet: apply vasoline and powder, wear two pairs of socks, then tightly lace up a pair of high-tops a full size too small. He allowed his players to eat only four ounces of beef at a time—never six or eight like the dining halls served—and kept tight demands on their social and sleep patterns. Wooden wasn’t a micromanager, but he set an example of mental, physical and relational preparedness that required a 24-hour, 365-day commitment to success. In addition to pure and simple hard work, Wooden saw to it that the right sort of work was getting done. Wooden covered every detail so that he could have a chance in every game. Over his coaching career, Wooden developed hundreds of short memorable phrases for each of the 15 boxes of his pyramid. At the base of his paradigm of success are a number of words that reinforce his convictions about life and success. Wooden faced criticism throughout his coaching career, often for his hard physical demands on his players and the break-neck pace of play he required, but he would simply reply, “If we can hang with them in the first half, we’ll beat them in the second half.” The earliest days at UCLA confirmed this: despite having an undersized and less-talented team most of the time (UCLA’s basketball program was an embarrassment until Wooden arrived), the Bruins trailed entire games until the final few minutes, when they could overcome their physically-exhausted opponents. Seth Davis’s introduction to Wooden is particularly illuminating. Coach’s deep love for words and books made him one of the most quotable leaders to ever live. Wooden’s sense of team is certainly his most well-known coaching trait. Four of the Wooden pyramid’s 15 steps toward “competitive greatness” are focused on developing a deep sense of teamwork. Coach’s practices developed individual skill through constant team drills. He rarely had his players working individually on ball skills or shooting; instead, they spent most of the two to three hour long practices, often twice a day, running through drills together. Literally, running: they began each practice with 30 minutes of three-man lane drills, simulating the fast break style of play that his teams relied on from start to finish. Next, shooting drills came primarily in the form of high-pressure game-simulated situations and scrimmaging. Finally, practice wouldn’t end until ten consecutive free throws had been made by ten different players—when a player missed a shot, the whole team ran, and then they started over. Occasionally, when the running pushed his players to dangerous levels of physical exhaustion, Coach would quietly walk to the free throw line himself, coolly sink ten consecutive free throws and mercifully end the day. The team-first preparation translated to team-first game situations. It’s almost unbelievable that Wooden’s UCLA teams won seven straight national championships, including a span of 88 consecutive games, and a total of ten in 12 seasons. It’s not that Wooden didn’t have phenomenal individual players—Lew Alcindor (Kareem Abdul-Jabbar), Bill Walton, Walt Hazzard and many others went on to great professional careers—but he inherited a minor program in UCLA (at the time of his hiring, they had a smaller gym than most Indiana high schools) and turned it into the most storied program in college basketball in a span of 27 years. For Wooden, basketball was more than a game, it was an opportunity. Like anything else, basketball was an opportunity to work hard, invest deeply in a few others and commit yourself to something great. From his early days on those dirt Indiana courts to the top of the ladder, cutting down ten sets of nets for the greatest college program in one of the world’s most visible cities, Wooden was focused on his priority: The team comes first. Second only to his consistent views on teamwork and cooperation, John’s views on personal character and integrity are established in the aura of his memory. His father Joshua gave him a Seven Point Creed to personalize and apply vital aspects of the faith to everyday life. Among all of Wooden’s terms, phrases and leadership lessons, the few simple words and brief descriptors outside the pyramid may be the most revealing of his heart. Wooden was a man of few words—another leadership lesson in itself—but when he spoke, the words stuck. No doubt, it was because each word was ripe with deep faith and resolute integrity. 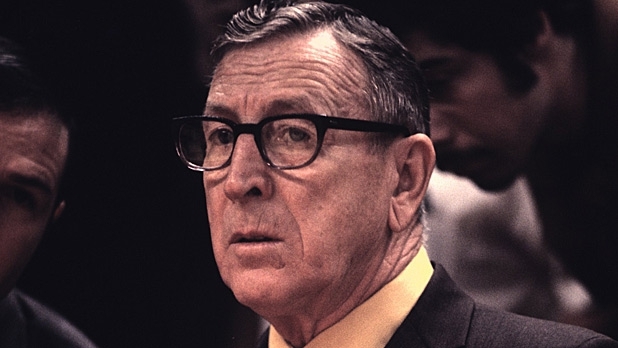 On May 26, 2010, just ten days short of his 100th birthday, Coach John Robert Wooden died of natural causes at UCLA’s Medical Center, surrounded by his son, daughter, three grandsons, four granddaughters and 13 great-grandchildren. To this day, UCLA’s basketball jerseys feature a small patch over the players’ hearts—fittingly, a small black pyramid featuring the initials JRW.